The heart connects to the brain through the autonomic or visceral nervous system, traditionally thought to operate mostly without conscious control (breathing being a notable exception). The sympathetic projections of the autonomic system can increase heart rate in stressful situations, while the parasympathetic fibers slow the heart down when appropriate. There are also two sets of nerves connecting heart and brain: spinal nerves,with the dorsal root containing afferent sensory projections, and the ventral root for efferent motor fibers. In addition to spinal nerves, the vagus nerve supplies parasympathetic fibers including mostly (85%) afferent fibers, while the rest are brain-to-viscera efferent (brain to motor) fibers that project from the medulla oblongata in the brainstem, and which, if working properly, can rapidly increase or decrease heart rate as needed via innervation of the cardiac muscle. 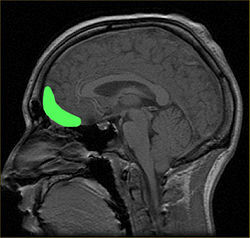 The afferent fibers projecting from viscera to brainstem do so viscerotopically, preserving information about spatial extension or location of the viscera in the body that is subsequently processed (many researchers would say “represented”) in the brain. Some researchers (notably (Olga Pollatos and Rainer Schandry, 2004), (Gray et al., 2007) have identified a heartbeat evoked potential that can be detected with EEG measurements: an increase in amplitude of neuroactivity or neuronal firing, detectable after averaging many instances together and subtracting “background” activity as noise, that seems to occur after a heartbeat. It is intriguing, and possibly of great significance for models of body-knowledge and interoceptive information access, that higher amplitude in the heartbeat evoked potential correlates well with better heartbeat perception in the Pollatos and Schandry research. 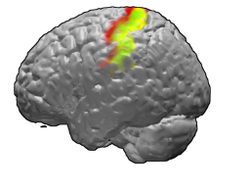 Data coming from fMRI and other imaging studies (magnetic electroencephalography, or MEG, and cerebral blood flow, or CBF) should shed additional light on the relative activity levels of cortical and subcortical structures that enable conscious perception of heartbeats, as well as unconscious central nervous system response to cardiac processes.